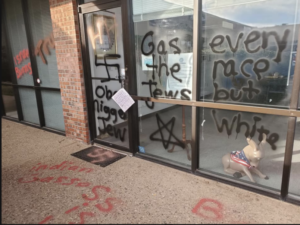 The Oklahoma Democratic Party headquarters defaced by anti-Semitic graffiti. Credit: Kate-Bierman via Facebook. 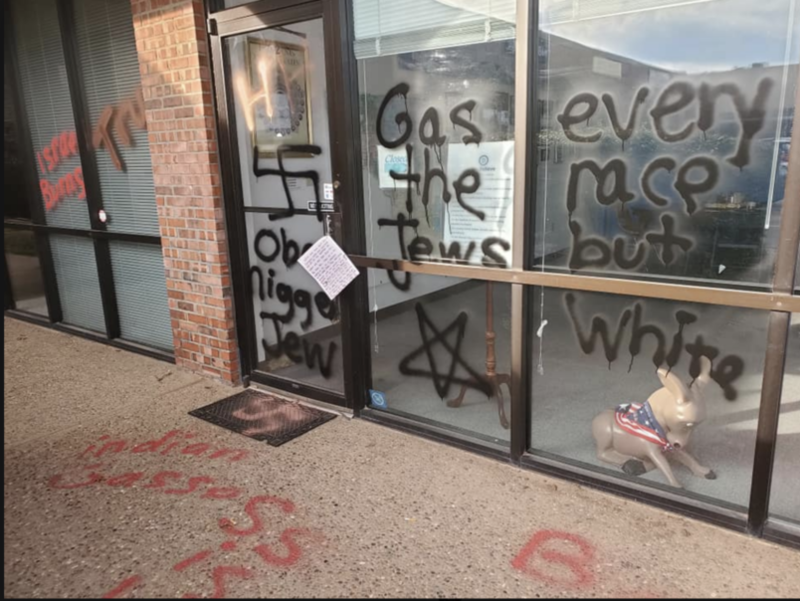 (JNS) Over the last week, swastikas, anti-Semitic, anti-LGBT, racist white-nationalist symbols and epithets defaced five public places in Oklahoma City and Norman, starting at the state’s Oklahoma City-based Democratic Party headquarters. Similar incidences of graffiti were found at the headquarters of the Chickasaw Nation (a federally recognized Native American nation), the Cleveland County Democratic Party headquarters in Norman, a public elementary school and a nonprofit art center. 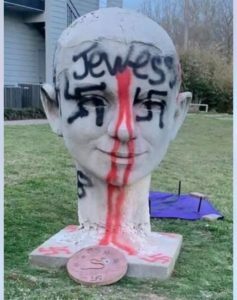 The Firehouse Art Center installation in Norman, Okla., defaced by anti-Semitic graffiti. Credit: Twitter. A note referred to as a “manifesto” was found at the door of the state Democratic Party headquarters by a city councilwoman; it was turned it over to the police as evidence and not made public. The police have been investigating the incidents as hate crimes, and released a photo and video of a female suspect holding a can of spray paint who appeared to be walking away from one of the attacks. An image of her getting into a gray sedan in another location was also captured. The police asked the public for help in identifying the suspect. Roberta Clark, executive director of the Jewish Federation of Greater Oklahoma City, told JNS that the federation had made public statements about the graffiti on its Facebook page, noting that the organization was “deeply saddened, again, to learn of anti-Semitic and racist vandalisms in Norman,” after making earlier statements condemning the graffiti in Oklahoma City. “Hateful rhetoric has no place in our community or country. When individuals or groups are targeted because of their immutable characteristics, the impact of those words and actions are felt by entire communities,” wrote Clark. “We are grateful to our law-enforcement community for taking each of these incidents seriously. We hope the perpetrator/s of these hateful actions will be found and brought to justice soon,” she told JNS via email. The Chabad of Oklahoma City’s Rabbi Ovadia Goldman told JNS that he was hesitant to make a public statement regarding the crimes because the perpetrator had not yet been caught, but he was willing to comment on the character of his hometown he’s gleaned in the last two decades. “From the elected officials to the police community to the general community, there has been nothing but love. My experience of 20 years in this community has been nothing but a loving, unified community. They love the Jewish community, they love Israel; we have never seen anything like this before,” he said. Imam Imad Enchassi, senior imam at the Islamic Society of Greater Oklahoma City, brought his power washer last week to the Democratic headquarters to clean up the anti-Semitic messages. He was also in Norman to help on April 3, telling local television reporters that the writing was clearly the work of the same hand. “I know what hate feels like and this is hate,” Enchassi told Fox25 News. Local and statewide politicians universally condemned the graffiti and its xenophobic messages. “One bigot with a can of spray paint or even a group of bigots do not speak for the hundreds of thousands in this city who stand strongly together against hate and bigotry,” wrote Mayor of Oklahoma City David Holt on his Facebook page. Democratic State Rep. Jacob Rosecrants spoke to JNS about growing up in Norman, Oklahoma, as a Roman Catholic. “For the most part, Norman is a university community, very inclusive. Like in other parts of the Midwest, it’s very Caucasian—my district is 80 percent Caucasian. Maybe there’s an underlying racism in more rural areas, a fear of outsiders or immigrants because people are afraid for their jobs, but it’s never gotten loud like this in urban or suburban areas. I’ve never seen anything like this in Norman. Anti-Semitism was literally never here before. I’ve never seen it,” he said. Victoria Lupia, a member of the Oklahoma City’s Jewish community, has lived in Oklahoma for more than 15 years, and explained that it has a Chabad House, as well as Conservative and Reform synagogues, as well as an active Hillel on campus at Norman’s University of Oklahoma. The university houses the Schusterman Center for Judaic and Israel Studies, where students can major or minor in the subject.